Thai Star is a small cozy restaurant with a relaxed feeling and typical Thai paintings and carvings giving it an Asian feeling. For many years it was located in Bonita Springs, but moved a few years ago to Fort Myers. It is a great place for lunch or dinner. Bill Vilaysack is the owner and host, and is assisted by his wife, Vong, who spends most of her time in the kitchen personally preparing delicious entrees. 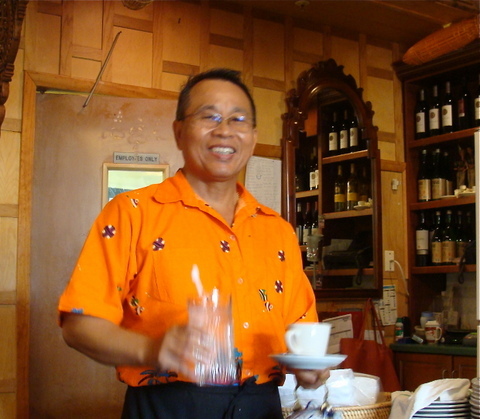 Bill is originally from Laos, and has spent a lot of time learning his trade in the United States. For many years, beginning in 1981, he worked in the catering group at South Seas Plantation on Captiva Island. He met Vong on a trip to Thailand in 1992 and they soon got married. Many of the herbs and fruits used in their meals are grown by Bill and his wife at home: basil, lemon grass, galangal, kafir limes and mangoes. In addition to her cooking Vong also enjoys shopping, especially shopping for fresh produce at local farmers markets. Her farmers market shopping area is quite broad – ranging from Immokalee in Collier County all the way north to St Petersburg, located in Pinellas County. The food at Thai Star is great, with all of your Thai favorites like Pad Thai, ginger sautee and many other stir fried dishes. They also have lots of good soups and salads, including tom yum and tom kha gai. The food is always fresh and delicious. Bill's hobby is fishing, and he is well known among other fisherman in the area for his success in catching pompano, snook and some of the other great game and eating fish in the salt water around Fort Myers and Bonita Springs. Although he doesn't serve his own catches in his restaurant, he certainly knows how to select great fish for his diners. Prices are reasonable, and they have wine and beer. Bill waits on you personally, and always remembers what your favorites are. You can either tell him you want your usual, or try something brand new. Either way, you won't be disappointed.